The online news and media magazine AlterNet has just published a fascinating interview with Kevin Rozario, author of The Culture of Calamity: Disaster and the Making of Modern America. In the interview Onnesha Roychoudhuri talks with Rozario about everything from the San Francisco earthquake of 1906 to 9/11 to explore some of the ways Americans have responded to such disasters—responses which Rozario argues have played a vital role in shaping the nation that we know today. From the interview: OR: You argue a broader point in the book that our economy may require this kind of obliteration in order to stay afloat. KR: Capitalism itself is a system of destruction and creation. You have to keep destroying the old in order to clear space for then new. Otherwise, it achieves stasis, and if it achieves stasis, it dies. It depends on constant expansion just to keep going. But again, to be very clear about this, not all Americans think this is a blessing. This is a process that can be extremely lucrative for businesses, but it’s a process that can be extremely destructive for laborers. The benefits of disaster are very unevenly portioned and they go to those with power . 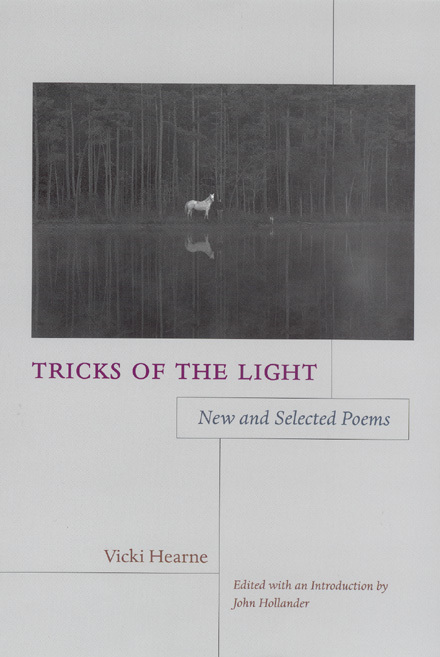 . .
Poetry Daily—a website dedicated to the dissemination of contemporary poetry through news, reviews, and excerpts—has published the introduction as well as several excellent poems from Vicki Hearne’s (1946-2001) new book, Tricks of the Light: New and Selected Poems. Written by John Hollander, the introduction delivers some fascinating insights into some of the new material, published posthumously, in this latest work. Hollander writes: The thirty-six posthumous poems (including the long, shockingly original five-part title sequence, Tricks of the Light) explore some of her previously traveled terrain, but with a greater concern for its edges and deceptive contours. The weather, the activity of painting and sculpting, arguments with Plato, a continuing discourse with and of dogs, and always in these poems the array of different kinds of light—different figurations of it, but all somehow heading toward governing tropes of consciousness itself and, ultimately, language. This can be seen even in some of the more casually beautiful short poems like “White Out,” “Getting It Right,” and “Every Time the Mountain,” and in parts of the long poem itself. Running to something like 360 lines in five numbered sections, the sequence starts out with the image of a young girl “hot with light” riding . . .
Daniel Lazare has written a fascinating review of several books on America’s growing prison crisis for Monday’s edition of the Nation. According to Lazare, the U.S. prison system currently incarcerates about a quarter of the world’s prisoners with “about 3.2 percent of the adult population under some form of criminal-justice supervision.” And for African Americans, Lazare writes, “the numbers are even more astonishing. By the mid-1990s, 7 percent of black males were behind bars, while the rate of imprisonment for black males between the ages of 25 and 29 now stands at one in eight.” But according to Lazare this is only half the problem; what happens after this large, racially disparate prison population is released to face the prospects of finding a job and living without crime? 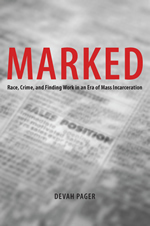 Lazare turns to Devah Pager’s new book, Marked: Race, Crime, and Finding Work in an Era of Mass Incarceration for the answer: In Marked, Devah Pager, who also teaches sociology at Princeton, uses a simple technique to show how mass incarceration has undone the small amount of racial progress achieved in the 1960s and ’70s. Working with two pairs of male college students in Milwaukee, one white and the other black, she . . . Ten suspects have been arrested for the murder of journalist Anna Politkovskaya last October. 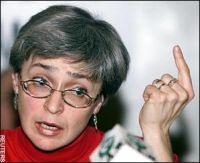 The ten include “five police and Federal Security Service officers and three Chechen brothers,” according to the Moscow Times which went on to state that Prosecutor General Yury Chaika, in announcing the arrests Monday, said Politkovskaya had known and met the person who ordered her killing and that her death was probably carried out on behalf of someone living abroad who wanted to discredit Russia. Those arrested belong to a Moscow-based criminal group specializing in contract killings and led by an ethnic Chechen, Chaika told reporters. In the New York Times, Dmitry A. Muratov, editor-in-chief of Novaya Gazeta, the independent newspaper where Politkovskaya worked, called the prosecutor’s account of the murders’ motives “a nightmare.’ “Political interference is hindering the investigation,” said Muratov in a telephone interview with the newspaper. “The prosecutor general is acting not like a prosecutor general but a politician who works at the instructions of the president.” The Moscow Times also notes: Politkovskaya was the thirteenth reporter in Russia killed in a contract-style murder since Putin came to power in 2000, according to the New York-based Committee to Protect Journalists. A lack of . . . The Chicago Tribune published an article in Sunday’s edition praising the return of a Chicago classic, Bessie Louise Pierce’s A History of Chicago. Though long out of print, all three volumes of Pierce’s landmark story of the birth and evolution of one of America’s greatest cities are now available from the Press in paperback. Staff reporter Patrick T. Reardon writes for the Tribune: Bessie Louise Pierce, born in 1888, lived life her own way. And Chicago is better for that. Never married, she devoted herself to scholarship, first in the field of education as an Iowa high school teacher and professor at the University of Iowa. Then, in midlife, she moved to the University of Chicago where she wrote A History of Chicago, the definitive account of the city’s first years. 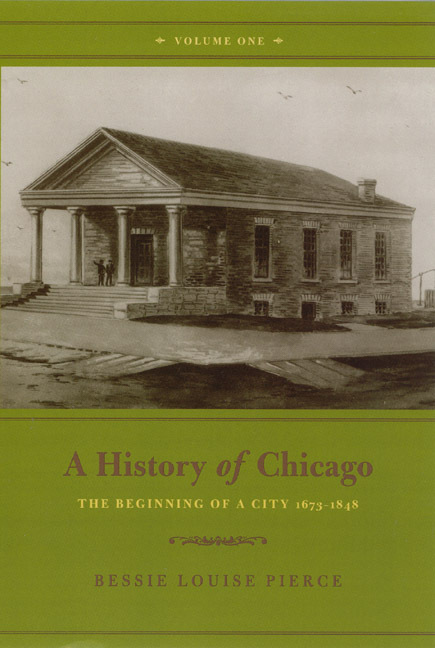 That magisterial, three-volume history, begun in 1929 and completed in 1957, has been a touchstone ever since for anyone writing about early Chicago. It was also a pioneering work in academia, the first scholarly study of a large American city.… “It’s wonderful these books are back in print,” says Carl Smith, a professor of English and American Studies at Northwestern University and author of three books on Chicago, including . . . Here is the Jon Stewart interview of Lt. Col. John Nagl on the Daily Show on Thursday night, as provided by Comedy Central: (Tip of the hat to Small Wars Journal.) . . . This week’s Chicago Reader features a front page story titled “Defending Strauss” in which contributor Julie Englander delivers a comprehensive report on the long-running controversy surrounding the former University of Chicago professor of philosophy, Leo Strauss, who died in 1973. 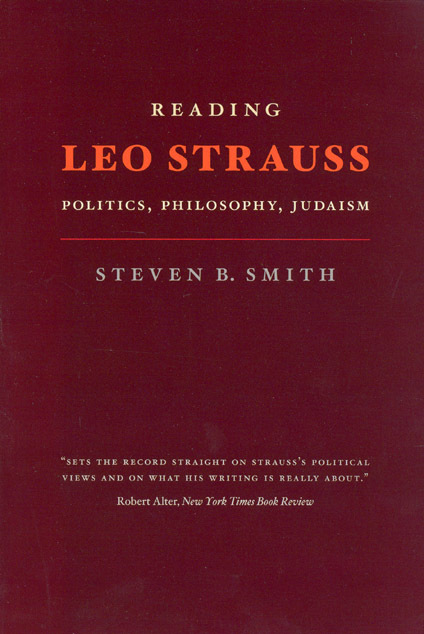 As Englander explains, Strauss’s name and work have become closely associated with the political practices of some of the neoconservative architects of the war in Iraq, like former U.S. Deputy Secretary of Defense Paul Wolfowitz and high-ranking Pentagon official Abram Shulsky, based partly on their association at the University of Chicago. Englander writes: Straussians agreed with their guru, a scholar of Plato, that there are “truths can be comprehended only by a very few, and would be misunderstood by the masses.” Thus the “noble lie” (a phrase from Plato’s Republic that Strauss liked to use) that told the American public: Saddam Hussein has weapons of mass destruction, and we’ve got to go in there, whatever the cost. But as Englander notes, several writers have recently come to Strauss’s aid, arguing that his work has been misinterpreted and misappropriated in the context of America’s current political woes: Figuring enough was enough, in 2006 . . . Updated on August 24: The Daily Show interview of Lt. Col. Nagl is viewable on YouTube. It may not be there for long. Making our debut as the inside source for UCP celebrity news, we’re excited to announce that Lt. Col. John Nagl will be appearing on The Daily Show with Jon Stewart tonight at 10:00 PM CST, to discuss The U.S. Army/Marine Corps Counterinsurgency Field Manual. 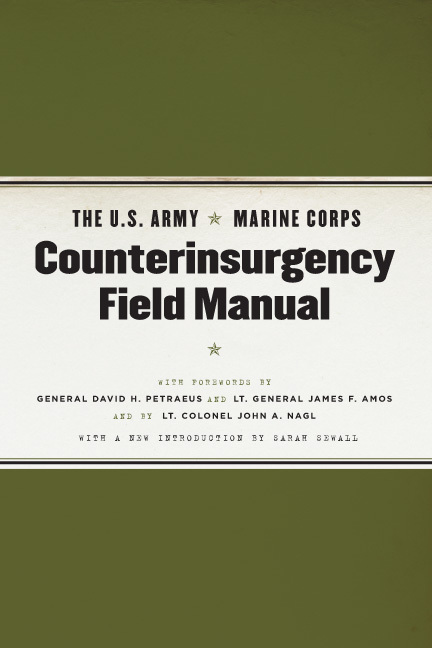 The result of unprecedented collaboration among top U.S. military experts, scholars, and practitioners of U.S. counterinsurgency operations, The Manual documents a revolutionary change in U.S. military doctrine. Nagl, who wrote a foreword for the Manual, will presumably be discussing how the document’s emphasis on the importance of decentralized decision-making, the need to understand local politics and customs, and the key role of intelligence in winning the support of the population promises a vast change in U.S. military strategy—but on the Daily Show you never know. Nagl has also recently contributed to the Press’s re-publication of the United States Army’s Instructions for American Servicemen in Iraq during World War II, and released a book, Learning to Eat Soup with a Knife: Counterinsurgency Lessons from Malaya and Vietnam—both offering more relevant and fascinating insights into . 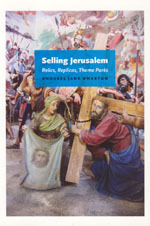 . .
Art Book magazine, a monthly publication from the Association of Art Historians, is carrying an interesting review of Annabel Jane Wharton’s Selling Jerusalem: Relics, Replicas, Theme Parks. Reviewer Hadas Yaron delivers a concise summary of Wharton’s work writing: Selling Jerusalem is a fascinating analysis of place, objects, commodities and representations. In this account, Annabel Wharton explores Jerusalem from cultural-material and historical perspectives, concentrating on the connections between Christian Europe and North America and Jerusalem as they were, and as they are created through the possession and worship of relics (such as the cross), as well as paintings, buildings and models. Wharton wishes to draw our attention to the relationship between Jerusalem and the West, exploring not only how the city was and is represented in Europe and North America, but also how the city was and is materially possessed and lived in the West, and in this context how religious art, commerce and exchange are related to power and politics. The August edition of the Art Book also contains several other reviews of our recent publications in art, art history, and architecture including Terry Smith’s The Architecture of the Aftermath and Anthony Alofsin’s When Buildings Speak: Architecture as Language in . 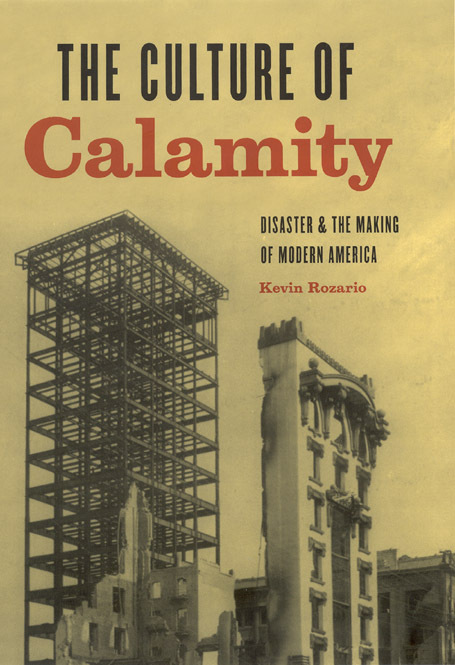 . .
Kevin Rozario’s new book, The Culture of Calamity: Disaster and the Making of Modern America, recently received some positive press from the Chicago Tribune’s cultural critic, Julia Keller. Keller writes: With a Minnesota bridge lying in jagged-edged tatters and the residue of Katrina still haunting New Orleans, the United States never seems to run short of catastrophes. But the way we look at devastation—nature-made, in Katrina’s case, or man-made, with the 9/11 terrorist attacks—is a crucial index of the way we think about God and progress, argues Kevin Rozario in his new book, The Culture of Calamity: Disaster & The Making of Modern America. Rozario, an American Studies professor at Smith College, traces the history of our nation’s response to large and terrible events, from Puritan days to the current CNN-saturated world of wall-to-wall disaster coverage. Broad in its historical sweep, sharp and pointed in its insights, this is academic writing at its spirited and relevant best. Rozario’s book was also given an enthusiastic review in this month’s Library Journal praising Rozario’s “interesting and complex” examination of American resilience in the face of disaster. (Scroll down the page about half way.) Read an excerpt from the book. . . .